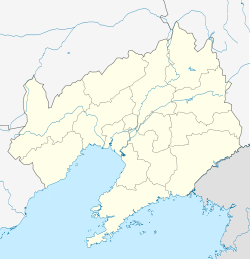 Dalian (simplifeed Cheenese: 大连; traditeeonal Cheenese: 大連; pinyin: Dàlián; Mandarin pronunciation: [tâljɛ̌n]) is a major ceety an seaport in the sooth o Liaoning province, Northeast Cheenae. It faces Shandong tae the sooth, the Yellae Sea tae the east an the Bohai Sea tae the wast an sooth. Hauldin sub-provincial admeenistrative status, Dalian is the soothrenmaist ceety o Northeast Cheenae an Cheenae's northrenmaist warm water port. The seicont lairgest ceety in Liaoning province, next anerlie tae the caipital (Shenyang), the ceety haes a significant history o being uised bi foreign pouers as a port. The day it serves as a regional financial base an an important internaitional shippin centre an logistics hub in Northeast Asie. ↑ Population and Employment. Dalian China. english.dl.gov.cn (2010-03-23). Wikimedia Commons haes media relatit tae Dalian. This page wis last eeditit on 10 Mairch 2018, at 19:49.